Wheelchair Accessible Travel. You CAN do it! Wheelchair Accessible Travel…You CAN do it! Where would you like to go? What would you like to do? The world is opening up to the wheelchair traveler and I am here to help your accessible travel dreams come true! I am a Certified Accessible Travel Specialist with more than 24 years hands on wheelchair travel experience which initially came from traveling with my husband. He has MS, uses a power chair and has not walked for 25 years. We have journeyed to many places and, through Wheelchair Escapes, have helped others to do the same. Please don't let a disability stop you from experiencing the joy of travel. The more wheelchair travelers there are, the better the services and experiences there will be for all to enjoy. There are accessible vehicles and tours throughout the world waiting for you. I work with providers around the globe who have inspected every path along the way and I know all the ins and outs. For example, many of my clients are surprised to find out that their wheelchair will fly for free. Yes, even a power chair! Many clients ask what my service charge is. I am happy to say that 99% of the time I am paid by the vendor. You get the benefit of my knowledge and experience basically for free. Think of it as a gift! Do you want to zip line or scuba dive or swim with the dolphins? Do want to travel to Europe, or go on a cruise? See our own National Parks? Remember, you will never know, if you do not ask. You will not do, if you do not try. I am here to help you. Also, I have the power of Cruise Planners behind me to be able to go the extra mile for you. Just ask Jayne Serfass, who couldn't believe so many options were available to her. "I am so grateful for crossing your path. 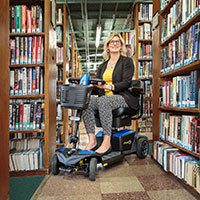 I never in a million years would have known what to look for in travel with a wheelchair," she said. "The airline, hotel and accessible van all worked great for me. I was able to have a long overdue visit with my kids. Your knowledge of travel for the disabled helped me to travel in safety and comfort." Jayne is not alone; check out other comments from clients. They will tell you how dedicated I am to great service and making sure you have a wonderful travel experience with all of your special needs met. Through Wheelchair Escapes, Kristy Lacroix has been making the travel dreams of the disability community come true for a quarter of a century. She was recently honored by the New Hampshire Better Business Bureau as a finalist for their Torch Award for 2017 for Marketplace Ethics in the small business category. She can be reached at (603) 382-3596 or kristy@wheelchairescapes.com. You can meet her in person and attend her Wheelchair Travel: You Can Do It! workshop at Abilities Expo Boston.